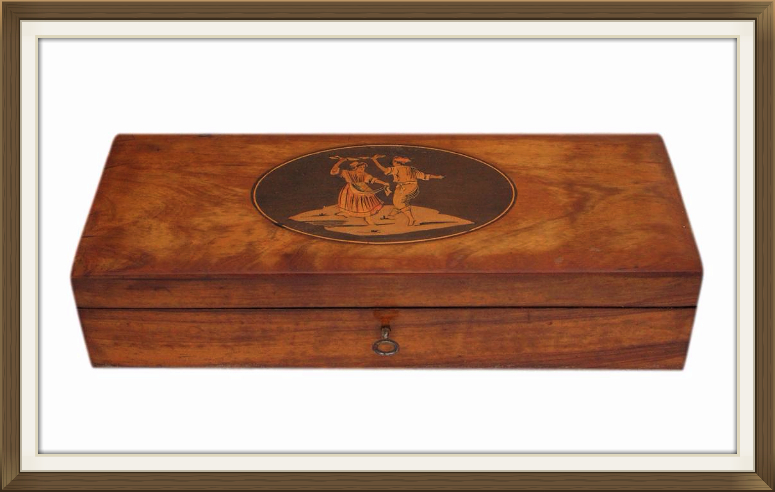 This is a beautiful vintage Italian jewellery box, made in the 1930s. It has a working lock and is complete with its original key. 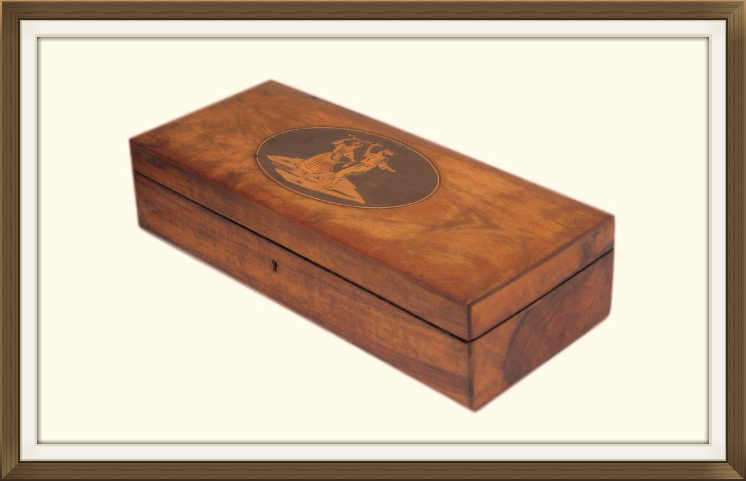 The box is made of solid Olive Wood and has a beautiful inlaid design on the lid. 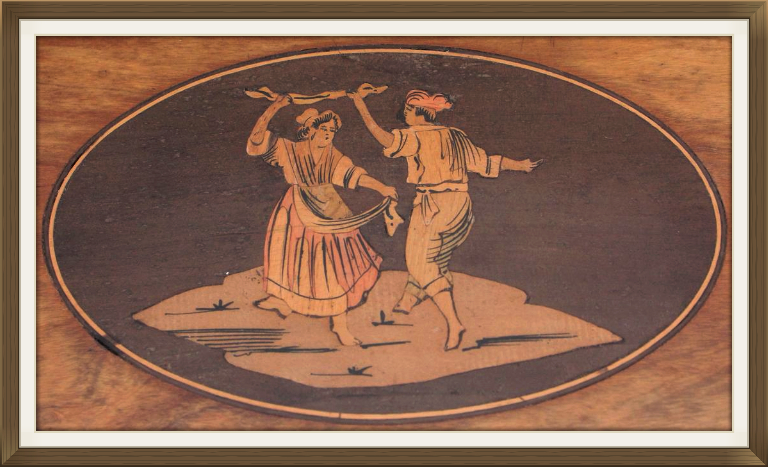 This is made up of various woods and features a couple performing an Italian folk dance. 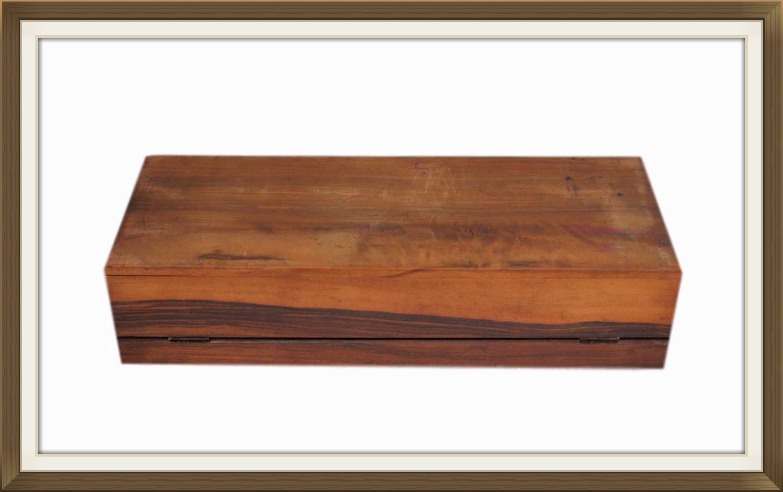 Some of the inlaid wood has been stained, which adds a lovely splash of colour to the decoration. 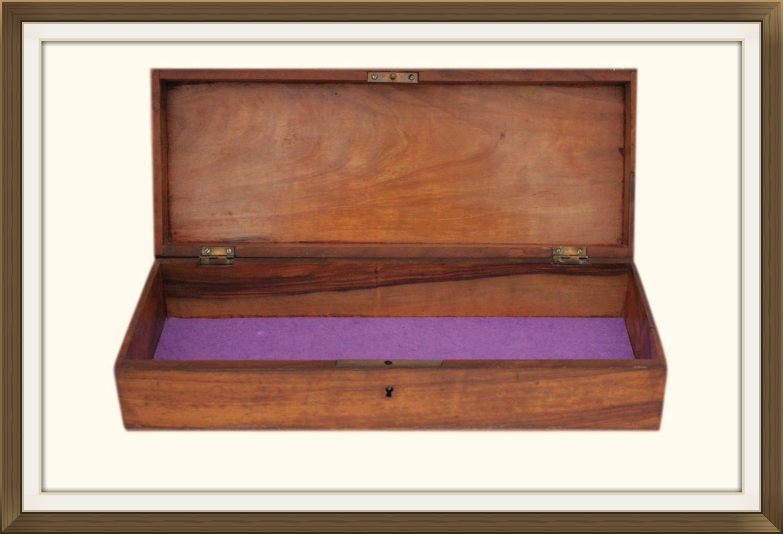 The box is complete with its original lock and also its original stop hinges. These prevent the lid from falling backwards. The interior has a single large compartment which is long enough to lay out chains. A new purple felt lining has been added to the base to protect the intended contents. This box was most likely made in Sorrento. Its long narrow shape suggests it was originally manufactured for use as a glove box. As with most old glove boxes it now makes for a much more functional jewellery box. 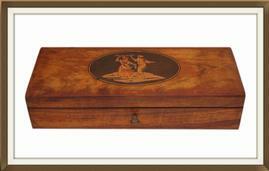 This wonderful box is in lovely condition for its 80 plus years of age. 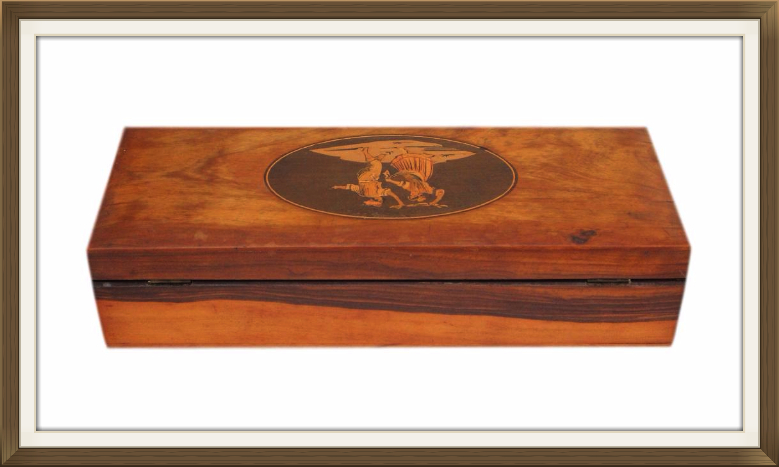 All of the inlay is present and intact, and the box is structurally sound. It has some surface wear as we'd expect from age and handling, but nothing unsightly that spoils its overall appearance. The bottom of the box has some surface scratches and a few red marks which appear to be from crayon or similar. This cannot be seen when the box is on display and is only evident when you turn the box over. There is a little play on the right hinge which does not affect the opening and closing of the lid. The box locks securely but is a little fiddly to unlock. To unlock it you need to wiggle the key gently to the right once you've turned it. The interior felt lining, being new, is in perfect condition. Please be aware that very old locks can suddenly malfunction at any time. We are not responsible for locks that fail from further age and wear once the box has been purchased. Please see our full policy for locks on our Payments & Returns Policy page. 27.8 by 9.8cm with a 3.8cm depth. International postage is £25, delivered fast within 5-7 working days. Postage is by Royal Mail International Tracked Post.